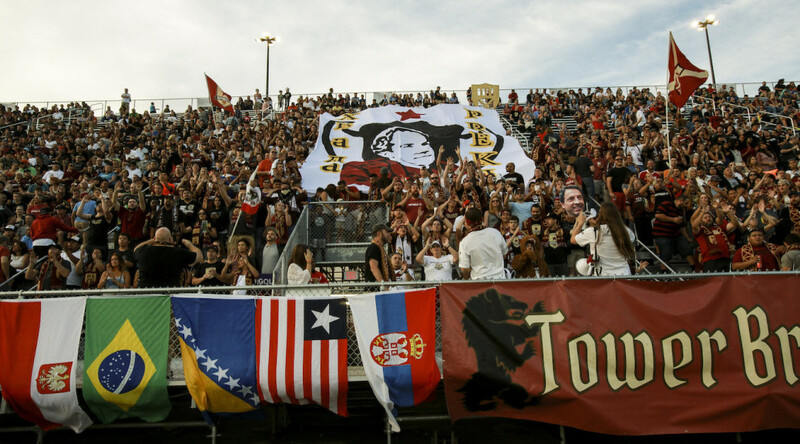 Octavio Guzman’s stoppage time penalty kick goal gives Republic FC a 1-1 draw with San Antonio FC at a sold out Bonney Field. Sacramento Republic FC attacked San Antonio FC early and saw there first chance on goal in the 7th minute when Cameron Iwasa was able to use some nifty footwork to get around his defender. Iwasa pushed his touch a bit too close to San Antonio FC keeper Josh Ford as the forward’s chipped shot attempt was blocked away by Ford, keeping the match scoreless early. San Antonio broke the deadlock in the 15th minute after a turnover in the Republic defensive end. Midfielder Rafa Castillo recovered the loose ball and drove towards goal before dropping the ball back to Sebastien Thuriere. The midfielder then rocketed a shot on goal, forcing Republic FC keeper Evan Newton to make a diving safe. Though he made the difficult save, forward Cesar Elizondo followed the shot and finished the rebound chance, blasting the ball into the back of the net and putting San Antonio FC ahead 1-0. Republic FC nearly equalized twice before halftime, both of them supplied by Tommy Thompson. In the 30th minute, Thompson attacked up the right flank, got to the touchline and sent a low, driven cross into the feet of forward Cameron Iwasa. With two defenders closing in, Iwasa drilled a one-touch shot up and over the keeper Ford but couldn’t beat the crossbar as it whizzed out of play. In the 38th minute, Thompson sent a dangerous cross into the box for defender Mike da Fonte. Beating his mark to the ball, da Fonte sent a powerful header on net, only to have Ford make another timely, acrobatic save preserving San Antonio FC’s 1-0 lead into the break. Republic FC continued to chase the equalizing goal and nearly found it in the 55th minute when defender James Kiffe struck a menacing right-footed shot from 20 yards out. The shot curled to the far post but San Antonio keeper Josh Ford was up to the task and made another clean save. Republic FC continued to pressure for the second half searching for a goal. About four minutes into stoppage time, James Kiffe earned a penalty kick after being taken down in the box chasing after a through ball. Midfielder Octavio Guzman stepped up to the spot and sent a right-footed shot to Ford’s right hand side. Ford guessed right on the penalty and was able to deflect the ball, but the shot had too much pace on it as it squeezed underneath Ford and into the net for the late equalizer for Guzman. In the last seconds of the match, second-half substitute Mackenzie Pridham had one more chance for a Republic FC winner. Pridham attacked across the face of goal, just outside the 18-yard box. The forward then sent a left-footed strike through three defenders and past a diving Ford. Unfortunately, the shot rolled inches past the far post and out of play. Pridham’s shot would serve as the last play of the match, as it ended in a 1-1 draw. Republic FC will go back on the road to take on Saint Louis FC on Saturday, August 13. Kickoff is 5:30 p.m. The match will be streamed live at SacRepublicFC.com/matchday.